The seventh book in the Alex Verus series. Diviner Alex Verus finally made one too many enemies on the Council of Mages, and now one of them is angry enough to have him executed. Fighting for his life is nothing new, but this kill order also calls for the death of Alex’s dependents—and there’s no way that he’ll let Luna, Anne, and Vari take the heat. With only a week before he’s history, Alex will have to figure out how to disassociate himself from his friends, scrounge up allies on the Council, and hopefully keep his head attached to his body. Jacka continues his consistently smart and exciting urban fantasy series, set in present-day London, with this finely crafted sixth installment (after Hidden). Series protagonist Alex Verus, a diviner who can see multiple futures, is grappling with long- and short-term problems . . . As usual, Jacka’s intelligent extrapolations of magic form the basis for a convincing story that features Alex’s prickly relations with his friends and allies—and that shows how magical powers complicate moral choices rather than simplifying them. Fortunately, Alex is as clever as he is cheeky, a sympathetic and daring grappler with ethical dilemmas. You can read the first chapter of Burned here. The following links will take you to online retailers where you can order Burned. 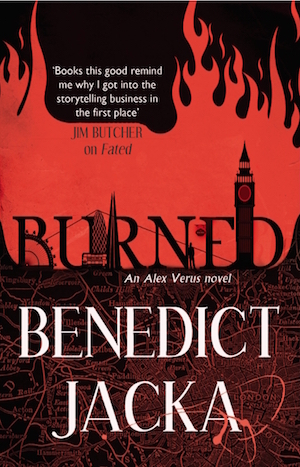 Like the previous books in the Alex Verus series, Burned is available in audio format. You can find it at the publisher’s website. Can’t wait. Am busy ‘re reading all the previous books in preparation for Burned. why is there a US and UK version? I think the Americans can figure out that colour and color are the same word. > I think the Americans can figure out that colour and color are the same word. Americans can. I am not sure the morons running the publishing industry can however. >> I think the Americans can figure out that colour and color are the same word. I’m an American and they don’t change a thing in the US version except the cover, so we still have things like colour and grey and torch, so I’m not sure why they even bothered making two “versions”. Love the entire series, but Burned is the best yet. Great development of characters and narrative. This last book was a real page turner and roller coaster of emotions. Great series thank you!